I can't believe it's about to be April! I've already seen little buds sprouting on the trees. Those flowers are getting ready to show themselves soon and I can't wait. Speaking of flowers...among all the gorgeous ones released this month we also released some pretty cute character stamps. Even though I have a mad crazy love for those flowers, I can't resist cute critters either! For me the big top background just makes this card! I love how easy it is to line up and fill the entire background. You can see just how easy, along with the entire making on the card, in the video below. That juggling bear just makes me smile! I love how the accessories in the set really support a scene style card. Since I used the die cut panel I couldn't fit all the characters in my card. I guess it's a good excuse to have to use the set again. 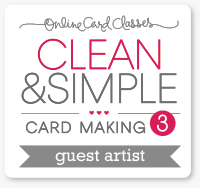 You can find a full list of supplies used on today's card HERE on my blog. For your convenience, here is a list of the featured Wplus9 supplies used on today's project(s), along with links to purchase. For a complete list of all supplies, click here. Good morning! 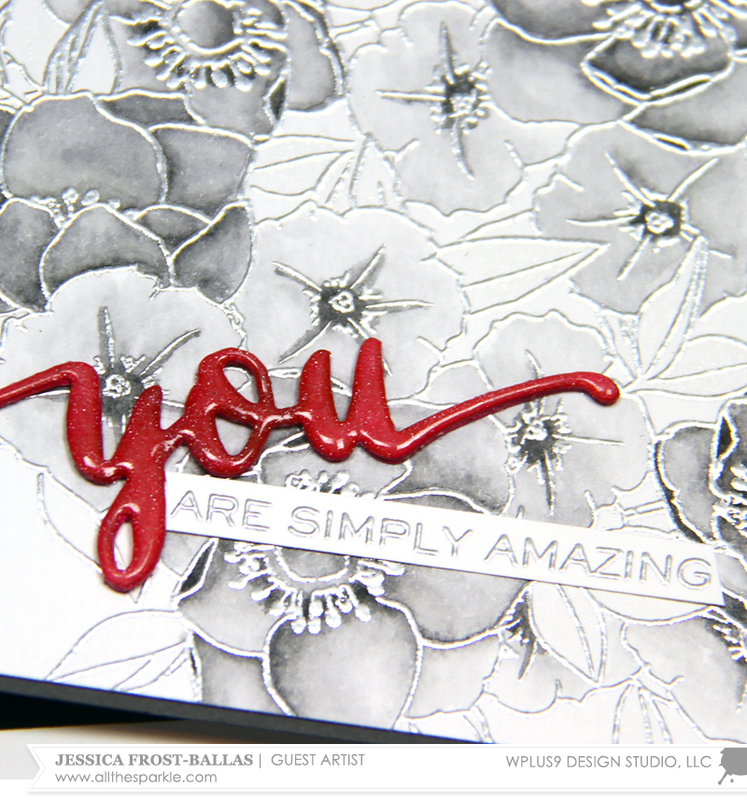 Jess here from All the Sparkle and I am thrilled and honored to be guesting on the WPlus9 blog today! 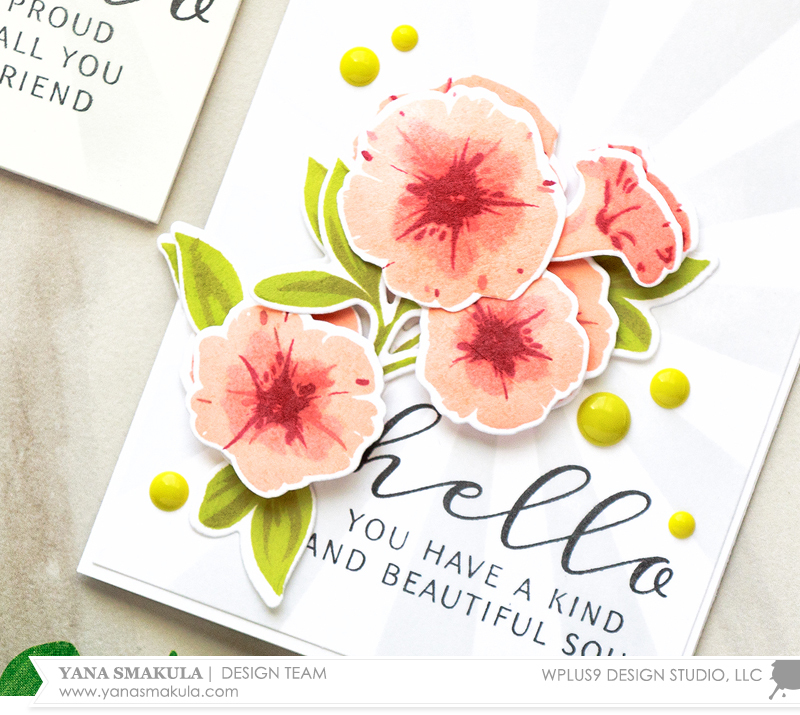 I love the big floral spray in the Kind Soul set and today I wanted to show a few different ways to use it! First I wanted to use masking to create a large floral bouquet! 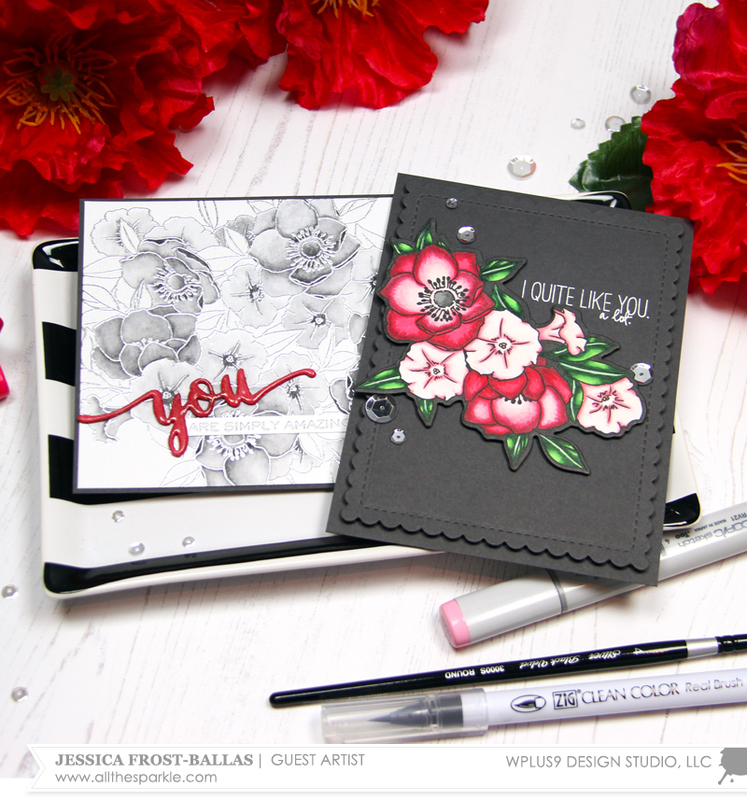 I used my MISTI stamp positioner to stamp the floral spray from Kind Soul onto watercolor paper with Versamark ink and then heat-embossed it with silver embossing powder. Next I stamped it onto masking paper and fussy cut it before placing it over the embossed image. I shifted the floral spray so it would overlap the masked image and stamped it again with Versamark before heat-embossing it with silver embossing powder. I wanted to keep the background simple so I watercolored it with a single dark grey Zig Clean Color real brush marker. For the larger flowers I drew directly on the flower and then blended it out with a damp paintbrush. For the smaller flowers I scribbled the marker onto an acrylic block, diluted it with a little water, and painted it onto the flower. Once I was happy with the coverage I set it aside to dry while I worked on the rest of the card. 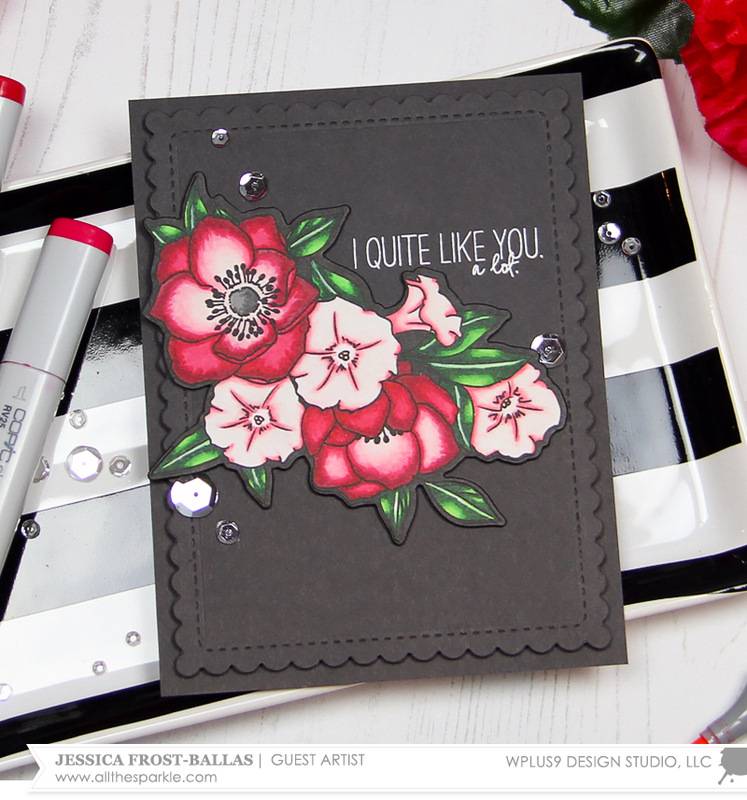 To create the sentiment I swiped PURE Color dye ink in Sweet Gelato over a piece of white cardstock. It would have been easier to use the Sweet Gelato cardstock but I ran out! ;) Then I die-cut it with the Hand Lettered Thanks die twice and adhered them together with Glossy Accents. Next I colored the die with the Spectrum Noir Clear Sparkle Marker until it was sparkly and then coated it with a layer of Glossy Accents. I stamped the rest of the sentiment from Hand Lettered Thanks onto white cardstock with Versamark and heat-embossed it with silver embossing powder before trimming it down to a thin angled label. Once everything was totally dry I trimmed the background panel down and adhered it to Coal Mine cardstock and adhered the sentiment to the bottom left corner of my card. 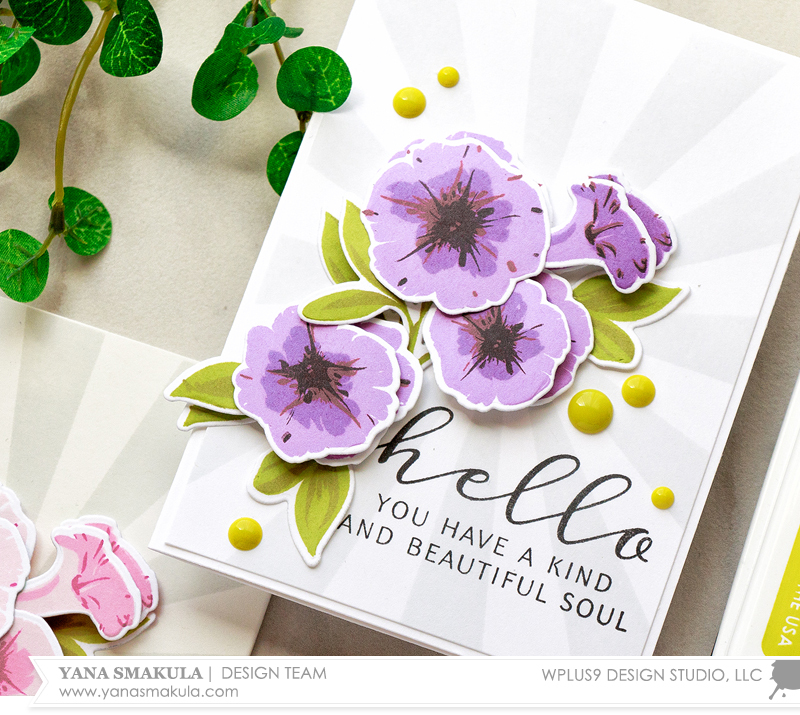 My next card uses just part of the floral spray from Kind Soul to create a smaller floral arrangement! 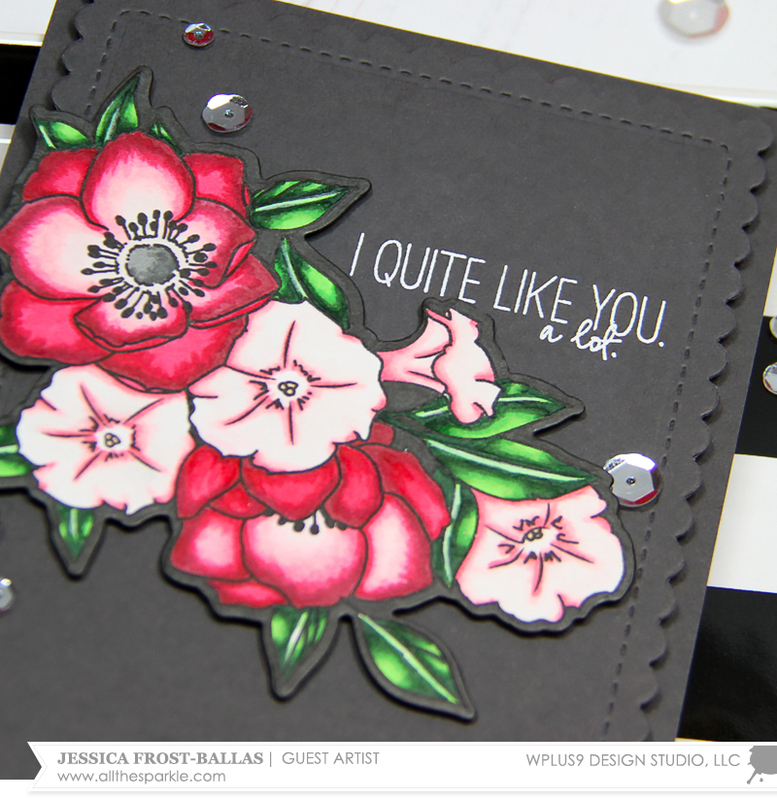 I love the floral spray from Kind Soul but thought it would be fun to alter the stamp to create a smaller floral arrangement. I stamped it onto White cardstock with Black dye ink and colored it with copics. I used R39, RV29, RV25, RV23, RV21, T4, and T7 for the larger flowers, R000, R000, and RV23 for the smaller flowers, and G21, YG06, YG09, G28, and G29 for the foliage. I used the coordinating Kind Soul Die to die cut the spray and then hand trimmed one edge to make it a smaller arrangement. I made sure to leave a small border approximately the same width that the die leaves. Then I used a trick my friend showed me to disguise the bright white edge of the die by coloring it the same color as my background panel so that the floral spray pops. T8 is a close match for Coal Mine cardstock. For your convenience, here is a list of the featured Wplus9 supplies used on today's project(s), along with links to purchase. Please note: this list may contain some affiliate links. For my monthly video tutorial I decided to explore a 3D decoupage look and translate it onto my cards. 3D decoupage is the art of layering paper to create a 3d effect by cutting out elements of varying sizes from a series of identical images and layering them on top of each other, usually with foam adhesive between each layer to give the image more depth. 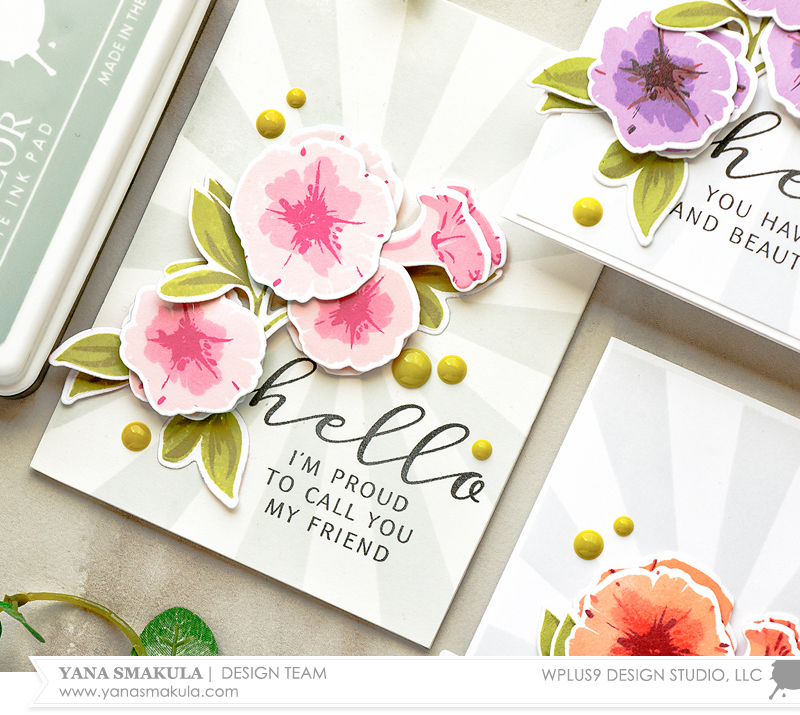 I used the Petunia Builder stamps and dies to create a faux 3D decoupage look on my 4 Bar cards. To create a 3D decoupage look I needed to first make identical images and I did so by stamping two of each image onto white paper. My images are identical in size and I will offset them when I go to foam mount them to add additional dimension to my card. I used my mini MISTI stamp positioner and stamped 2 sets of images - flowers and leaves using 2 sets of ink colors. I used Miami Spice, Sweet Nectar and Flamingo colors to stamp peach colored petunias and Bloomsberry, Cockleshell and Cranberry to stamp purple petunias. I also stamped leaves using Last Leaf and Appletini ink. As soon as my stamping was done I cut these images out using coordinating dies. 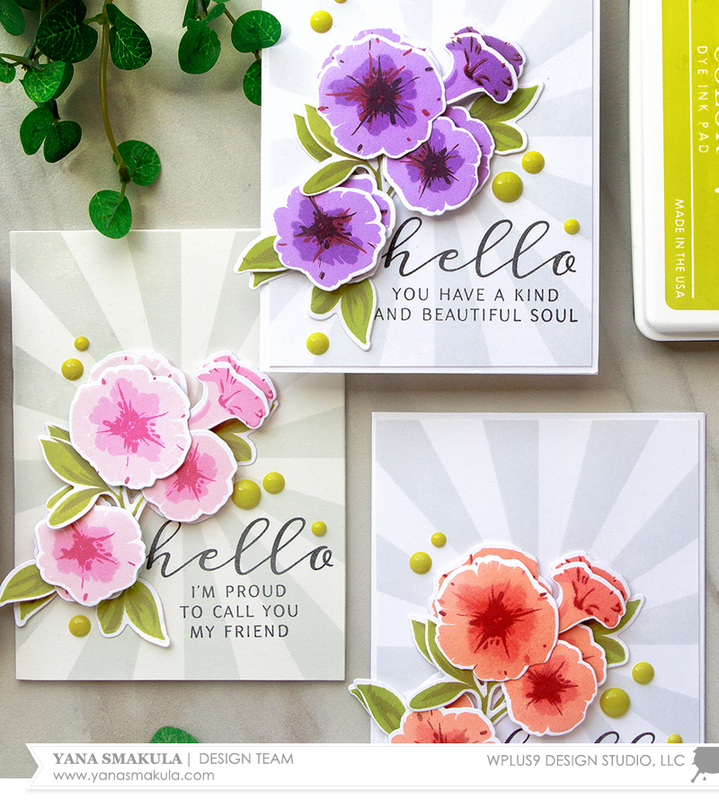 Since this technique requires a lot of cutting it's best to have coordinating dies for your images so that you're not doing a ton of cutting by hand. After I die cut my flowers I noticed the centers became too pale for my taste, so I used Cranberry Crush ink and re-stamped those to make them much more prominent on my flowers. I used Cranberry crush for my peach flowers and also intensified the centers on my purple flowers by using black ink. 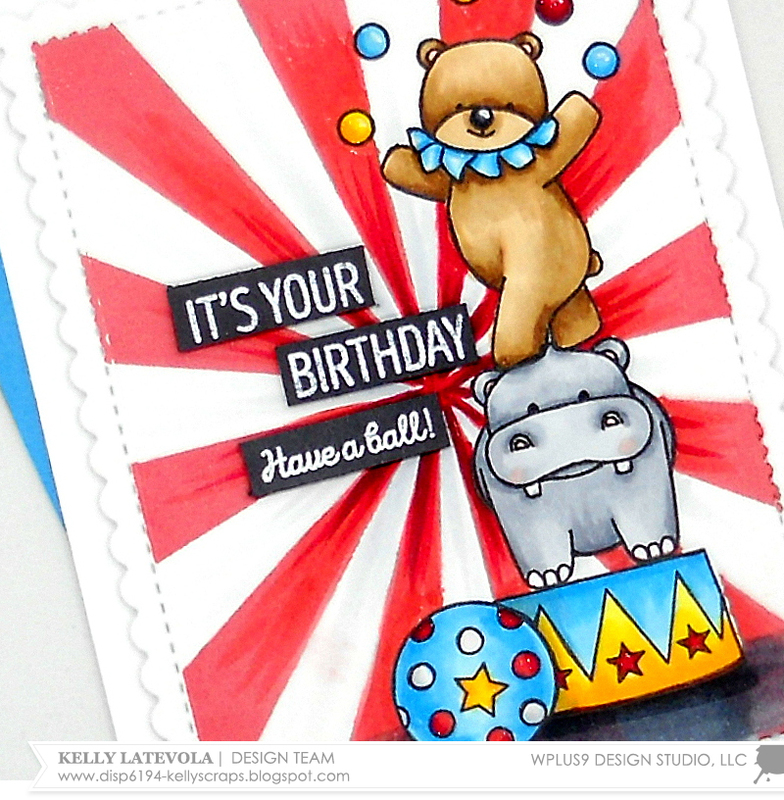 I made simple backgrounds using the Big Top Background stamp and stamped it using Fairy Dust Ink Color. I also added a sentiment onto each of my panels and my sentiments came from the Kind Soul stamp set. I used two kinds of adhesive to adhere my die cut pieces - foam adhesive and glue. Glue was used to adhere leaves (the bottom layer of leaves) and foam adhesive used to adhere flowers and 2nd layer of leaves. For a true 3D decoupage look you'll need to foam mount smaller images over your main images, but since I didn't have smaller versions for each image (I had some smaller flowers but I didn't have a smaller version of a flower that is facing sideways and smaller versions of leaves) I foam mounted identical images and simply offset them. Lastly, I embellished my cards using few enamel dots in green.